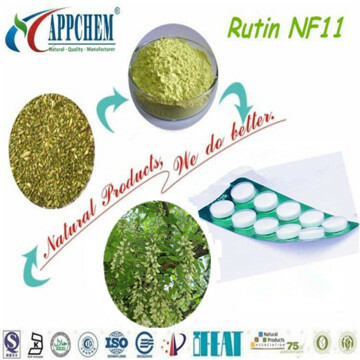 [Product resource]: Extracted from dried bud of Sophora japonica L.
[Application scope]: Rutin has a Anti-inflammatory functions , function of Vitamin P , Antivirus effect and restrain the activity of aldose reductase .It used to prevent stroke, hypertension, retinal hemorrhage, purpura, and acute hemorrhagic nephritis. The treatment of chronic bronchitis, efficiency reaches 84.8% and 98%. Troxerutin as its derivatives used in the treatment of burns, arthritis & all kinds of vascular disease, has been the sale of goods abroad. China also produces this drug : the efficiency for cerebrovascular disease 87.8%, cure retinal edema and bleeding 88%. [Process flow]: Raw material → Extraction → Crystallization→ Crude product → Recrystallization → Rutin .